The Collections Department at McWane Science Center is dedicated to the collection, preservation, and study of Alabama’s rich resources in the fields of paleontology, geology, archaeology, and zoology. The McWane Collection is open to scientific researchers and students currently advised by researchers. Hundreds of cataloged Late Cretaceous mosasaurs, dinosaurs, turtles, fishes, sharks, birds, marine and flying reptiles. The world’s largest collection of Pennsylvanian vertebrate and invertebrate ichnofossils and plants from Alabama’s famed Union Chapel Mine. The state’s largest collection of Late Pleistocene mammals, reptiles, amphibians, birds, and fishes. Collections of Eocene and Miocene mammals. A collection of over 5,000 freshwater mussels and snails collected circa 1910. A collection of over 400 bird skins collected circa 1910. Large collections of southeastern U.S. Archaeological artifacts. Field, D., Hanson, M., Burnham, D., Wilson-Brantley, L., Super, K., Ehret, D., Ebersole, J.A., Bhullar, B-A.S. 2018. Complete Ichthyornis skull illuminates mosaic assembly of the avian head. Nature 557: 96-100. doi:10.1038/s41586-018-0053-y. Phillip C. Sternes, P.C, and K. Shimada. 2018. Paleobiology of the Late Cretaceous sclerorhynchid sawfish, Ischyrhiza mira (Elasmobranchii: Rajiformes), from North America based on new anatomical data. Historical Biology. DOI: 10.1080/08912963.2018.1452205. Brownstein, C.D. 2018. The biogeography and ecology of the Cretaceous non-avian dinosaurs of Appalachia. Palaeontologica Electronica 21.1.5A. https://doi.org/10.26879/801. Gentry, A.D., and J.A. Ebersole. 2018. The first report of Toxochelys latiremis Cope 1873 (Testudines: Panchelonioidea) from the early Campanian of Alabama, USA. PaleoBios 35:1-10. Ebersole, J.A. and D.J. Ehret. 2018. A new species of Cretalamna sensu stricto (Lamniformes, Otodontidae) from the Late Cretaceous (Santonian-Campanian) of Alabama, USA. PeerJ, https://peerj.com/articles/4229/. Ebersole, J.A., S.M. Ebersole, and D.J. Cicimurri. 2017. The occurrence of early Pleistocene marine fish remains from the Gulf Coast of Mobile County, Alabama, USA. Palaeodiversity 10(1): 97-115. https://doi.org/10.18476/pale.v10.a6. Gentry, A.D. 2016. New material of the Late Cretaceous marine turtle Ctenochelys acris Zangerl, 1953 and a phylogenetic reassessment of the ‘toxochelyid’-grade taxa. Journal of Systematic Palaeontology 1-22, doi: 10.1080/14772019.2016.1217087. Jiménez-Huidobro, P., T. R. Simõesa, and M. W. Caldwell. 2016. Re-characterization of Tylosaurus nepaeolicus (Cope, 1874) and Tylosaurus kansasensis Everhart, 2005: Ontogeny or sympatry? Cretaceous Research, doi:10.1016/j.cretres.2016.04.008. Jacquemin, S. J., D. J. Cicimurri, J. A. Ebersole, M. Jones, Z. Whetstone, and C. N. Ciampaglio. 2016. Quantifying heterodonty in the late Devonian (Upper Famennian) sharks Cladoselache and Ctenacanthus from the Ohio Shale, USA. PalArch’s Journal of Vertebrate Palaeontology 13(1):1-20. Prieto-Márquez, A., G. M. Erickson, and J. A. Ebersole. 2016. A primitive hadrosaurid from southeastern North America and the origin and early evolution of ‘duck-billed’ dinosaurs. Journal of Vertebrate Paleontology. DOI: 10.1080/02724634.2015.1054495. Cicimurri, D.J., and J.A. Ebersole. 2015. Paleocene chimaeroid fishes (Chondrichthyes: Holocephali) from the eastern United States, including two new species of Callorhinchus. PaleoBios 32:1-29. Cicimurri, D. J., and J. A. Ebersole. 2015. Two new species of Pseudaetobatus Cappetta, 1986 (Batoidea: Myliobatidae) from the southeastern United States. Palaeontologica Electronica 18.1.15A:1-17. D’Emic, M.D., K.M. Smith, and Z.T. Ansley. 2015. Unusual histology and morphology of the ribs of mosasaurs (squamata). Palaeontology 2015:1-10. Rothschild, B., and M.J. Everhart. 2015. Co-ossification of vertebrae in mosasaurs (Squamata, Mosasauridae); evidence of habitat interactions and susceptibility to bone disease. Transactions of the Kansas Academy of Science 118(3-4):265-275. Ikejiri, T., and S.G. Lucas. 2015. Osteology and taxonomy of Mosasaurus conodon Cope 1881 from the Late Cretaceous of North America. Netherlands Journal of Geosciences 94(1):39-54. Ebersole, J. A., B. Bizzoco, K. Reed, and S. Jones. 2014. Preliminary Investigation of Sloss Quarters at Sloss Furnaces National Historic Landmark (1-JE-488), Jefferson County, Alabama. On file at the Alabama Historical Commission, Montgomery, Tracking No. 12-0699. 41 pp. Cicimurri, D. J., and J. A. Ebersole. 2014. Late Cretaceous chimaeroids (Chondrichthyes: Holocephali) from Alabama, USA. PaleoBios 31(2):1-14. Ehret, D. J., and J. A. Ebersole. 2014. Occurrence of the megatoothed sharks (Lamniformes: Otodontidae) in Alabama, USA. PeerJ 2:3625; DOI 10.7717/peerj.625. Ikejiri, T., and S. G. Lucas. 2014. Osteology and taxonomy of Mosasaurus conodon Cope 1881 from the Late Cretaceous of North America. Netherlands Journal of Geosciences, p. 1-16. Jasinski, S. E., and S. C. Wallace. 2014. Investigation into the paleobiology of Dasypus bellus using geometric morphometrics and variation of the calcaneus. Journal of Mammalian Evolution 21(3):285-298. Rodriguez, S., and D. C. Kopaska-Merkel. 2014. Mississippian rugose corals from Alabama: a review. Journal of Paleontology 88(5):829-850. Ciampagalio, C. N., D. J. Cicimurri, J. A. Ebersole, and K. E. Runyon. 2013. A note on Late Cretaceous fish taxa recovered from stream gravels at site AGr-43 in Greene County, Alabama. Bulletin of the Alabama Museum of Natural History 31:84-97. Ebersole, J. A., and L. S. Dean. 2013. The history of Late Cretaceous vertebrate research in Alabama. Bulletin of the Alabama Museum of Natural History 31(1):4-45. Ebersole, J. A., and T. Ikejiri (eds). 2013a. Contributions to Alabama Cretaceous Paleontology. Bulletin of the Alabama Museum of Natural History 31(1):1-113. Friedman. M. K., K. Shimada, M. J. Everhart, K. J. Irwin, B. S. Grandstaff, ad J. D. Stewart. 2013. Geographic and stratigraphic distribution of the Late Cretaceous suspension-feeding bony fish Bonnerichthys gladius (Teleostei, Pachycormiformes). Journal of Vertebrate Paleontology 33(1):35-47. Ikejiri, T., J. A. Ebersole, S. M. Ebersole, and H. B. Blewitt. 2013. An overview of Late Cretaceous vertebrates from Alabama. Bulletin of the Alabama Museum of Natural History 31(1):46-71. Jasinski, S. E. 2013. Review of the fossil Trionychidae (Testudines) from Alabama, including the oldest record of trionychid turtles from Eastern North America. Bulletin of the Alabama Museum of Natural History 31(2). Loewen, M. A., R. B. Irmis, J. J. W. Sertich, P. J. Currie, and S. D. Sampson. 2013. Tyrant dinosaur evolution tracks the rise and fall of Late Cretaceous oceans. PlosOne 8(11). Loewen, M. A., R. B. Irmis, J. J. W. Sertich, P. J. Currie, and S. D. Sampson. 2013. Supplemental to: Tyrant dinosaur evolution tracks the rise and fall of Late Cretaceous oceans. PlosOne 8(11). Schein, J. P., D. C. Parris, J. C. Poole, and K. J. Lacovara. 2013. A nearly complete skull of Enchodus ferox (Actinopterygii, Aulopiformes) from the Upper Cretaceous Ripley Formation of Lowndes County, Alabama. Bulletin of the Alabama Museum of Natural History 31(1):78-83. Shimada, K. 2013. Chondrichthyan origin for the fossil record of the Tselfatiiform Osteichthyan fish, Thryptodus zitteli Loomis, from the Upper Cretaceous Mooreville Chalk of Alabama. Bulletin of the Alabama Museum of Natural History Bulletin 31(1):72-77. Uhen, M. D. 2013. A review of North American Basilosauridae. Bulletin of the Alabama Museum of Natural History 31(2):1-45. Houssaye, A., and N. Bardet. 2012. Rib and vertebral micro-anatomical characteristics of hydropelvic mosasauroids. Lethaia 45:200-209. Houssaye, A., and P. L. Tafforeau. 2012. What vertebral microanatomy reveals about the ecology of juvenile mosasaurs (Reptila, Squamata). Journal of Vertebrate Paleontology 35(5):1042-1048. Jovanelly, T. J., and L. Lane. 2012. Comparison of the functional morphology of Appalachiosaurus and Albertosaurus. The Open Geology Journal 6:65-71. Konishi, T., J. Lindgren, M. W. Caldwell, and L. Chiappe. 2012. Platecarpus tympaniticus (Squamata, Mosasauridae): Osteology of an exceptionally preserved specimen and its insights into the acquisition of a streamlined body shape in mosasaurs. Journal of Vertebrate Paleontology 32(6):1313-1327. Beckenmeyer, R. J., and M. S. Engel. 2011. Upper Carboniferous insects from the Pottsville Formation of Northern Alabama (Insecta: Ephemeropterida, Palaeodictyopterida, Odonatoptera). Scientific Papers: Natural History Museum, The University of Kansas 44:1-19. Ebersole, J. A., and S. M. Ebersole. 2011. Late Pleistocene Mammals of Alabama: a comprehensive faunal review with 21 previously unreported taxa. Bulletin of the Alabama Museum of Natural History 28:1-66. Ebersole, S. M., and J. L. King. 2011. A review of non-avian dinosaurs from the Late Cretaceous of Alabama, Mississippi, Georgia, and Tennessee. Bulletin of the Alabama Museum of Natural History 28:81-93. Konishi, T., and M. W. Caldwell. 2011. Two new Plioplatecarpine (Squamata, Mosasauridae) genera from the Upper Cretaceous of North America, and a global phylogenetic analysis of Pleioplatecarpines. Journal of Vertebrate Paleontology 31(4):754-783. Parham, J. F., and J. A. Ebersole (eds). 2011. Paleontology papers in honor of Douglas E. Jones. Alabama Museum of Natural History Bulletin 28:1-93. Konishi, T., M. W. Caldwell, and G. L. Bell. 2010. Redescription of the holotype of Platecarpus tympaniticus Cope, 1869 (Mosasauridae: Plioplatecarpinae), and its implications for the alpha taxonomy of the genus. Journal of Vertebrate Paleontology 30(5):1410-1421. Semken, H. A., Jr., R. W. Graham, and T. W. Stafford, Jr. 2010. AMS 14C analysis of Late Pleistocene non–analog faunal components from 21 cave deposits in southeastern North America. Quaternary International 217(1–2):240–255. Semken, H.A., Jr., R. W. Graham, and T. W. Stafford, Jr. 2010. Supplemental data file 1 for AMS 14C analysis of Late Pleistocene non–analog faunal components from 21 cave deposits in southeastern North America. Quaternary International 217(1–2):1. Semken, H. A. Jr., R. W. Graham, and T. W. Stafford, Jr. 2010. Supplemental data file 2 for AMS 14C analysis of Late Pleistocene non–analog faunal components from 21 cave deposits in southeastern North America. Quaternary International 217(1–2):1–32. Konishi, T., and M. W. Caldwell. 2009. New material of the mosasaur Plioplatecarpus nichollsae Cuthbertson et al., 2007, clarifies problematic features of the holotype specimen. Journal of Vertebrate Paleontology 29(2):417-436. Shimada, K. 2009. The first associated teeth of the Late Cretaceous anacoracid shark, Pseudocorax laevis (Leriche), from the Mooreville Chalk of Alabama. Transactions of the Kansas Academy of Science 112(3/4):164-168. Konishi, T. 2008. Southernmost occurrence of Platecarpus planifrons (Squamata: Mosasauridae) from the Tombigbee Sand Member (Middle Santonian) of Alabama, USA, and a revised biostratigraphy of the genus. Proceedings of the Second Mosasaur Meeting 2008. Pellegrini, R. 2007. Skeletochronology of the limb elements of mosasaurs (Squamata; Mosasauridae). Transactions of the Kansas Academy of Science 110(1/2):83-99. Schein, J. P., and R. D. Lewis. 2007. Actinopterygian fishes from Upper Cretaceous rocks in Alabama, with emphasis on the Teleostean genus Enchodus. Paludicola 6(2):41-86. Shimada, K., and D. D. Brereton. 2007. The Late Cretaceous Lamniform shark, Serratolamna serrata (Agassiz), from the Mooreville Chalk of Alabama. Paludicola 6(3):105-110. Buta, R. J., A. K .Rindsberg, and D. C. Kopaska-Merkel (eds). 2005. Pennsylvanian Footprints in the Black Warrior Basin of Alabama. 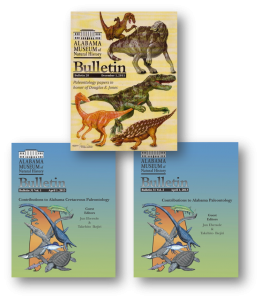 Alabama Paleontological Society Monograph No. 1. 387 pp. Carr, T. D., T. E. Williamson, and D. R. Schwimmer. 2005. A new genus and species of Tyrannosauroid from the Late Cretaceous (Middle Campanian) Demopolis Formation of Alabama. Journal of Vertebrate Paleontology 25(1):119-143. Lindgren, J., and M. Siverson. 2005. Halisaurus sternbergi, a small mosasaur with an intercontinental distribution. Journal of Paleontology 79(4):763-773. McDonald, H. G. 2003. Sloth remains from North American caves and associated karst features; pp. 1–16 in B. W. Schubert, J. I. Mead, and R. W. Graham (eds. ), Ice Age cave faunas of North America, Indiana University Press, Bloomington, Indiana. Chiappe, L. M., J. P. Lamb, Jr., and G. P. Ericson. 2002. New Enantiornithine bird from the marine Upper Cretaceous of Alabama. Journal of Vertebrate Paleontology 22(1):170-174. Kiernan, C. R. 2002. Stratigraphic distribution and habitat segregation of mosasaurs in the Upper Cretaceous of western and central Alabama, with an historical review of Alabama mosasaur discoveries. Journal of Vertebrate Paleontology 22:91–103. Parmalee, P. W., and R. W. Graham. 2002. Additional records of the giant beaver, Castoroides, from the Mid–South: Alabama, Tennessee, and South Carolina. Smithsonian Contributions to Paleobiology 93:65–71. Hooks, G. E., III. 1998. Systematic revision of the Protostegidae, with a redescription of Calcarichelys gemma Zangerl, 1953. Journal of Vertebrate Paleontology 18:85–98. Sheldon, A., and G. L. Bell, Jr. 1998. Paedomorphosis in mosasauroidea (Squamata): evidence from fossil bone microstructure. Paludicola 2: 190–205. Bell, G. L., Jr. 1997. A phylogenetic revision of North American and Adriatic Mosasauroidea. In: Callaway JM, Nicholls EL, editors. Ancient Marine Reptiles. San Diego. 293–332. Sheldon, A. 1997. Ecological implications of mosasaur bone microstructure. In: Callaway JM, Nicholls EL, editors. Ancient Marine Reptiles. San Diego: Academic Press. 293–332. Sheldon, A., and J. E. Donachy. 1996. Histological and biochemical analysis of bone from four genera of mosasaurs. Bulletin de l’Institut océanographique 14: 369–375. Holman, J. A. 1995. Pleistocene amphibians and reptiles in North America. Oxford Monographs on Geology and Geophysics. Oxford University Press, New York, 256 pp. Kiernan, C. R. 1992. Clidastes Cope, 1868 (Reptilia, Sauria): proposed designation of Clidastes propython Cope, 1869 as the type species. Bulletin of Zoological Nomenclature 49:137–139. Lively, R. S., G. L. Bell, Jr., and J. P. Lamb. 1992. Uranium–series dates from travertines associated with a Late Pleistocene megafauna in ACb–3, Alabama. Southeastern Geology 33(1):1–8. Parmalee, P. W. 1992. A Late Pleistocene avifauna from northwestern Alabama. Natural History Museum of Los Angeles County, Science Series 36:307–318. Holman, J. A., G. Bell, and J. Lamb. 1990. A Late Pleistocene herpetofauna from Bell Cave, Alabama. Herpetological Journal 1:521–529. Martin, R. A., and R. H. Prince. 1990. Variation and evolutionary trends in the dentition of Late Pleistocene Microtus pennsylvanicus from three levels in Bell Cave, Alabama. Historical Biology 4:117–129. Churcher, C. S., P. W. Parmalee, G. L. Bell, Jr., and J. P. Lamb, Jr. 1989. Caribou from the Late Pleistocene of northwestern Alabama. Canadian Journal of Zoology 67:1210–1216. Martin, L. D. and B. M. Rothschild. 1989. Paleopathology and diving mosasaurs. American Scientist 77(3):460-467. King, D. T., J. P. King, G. L. Bell, Jr., J. P. Lamb, Jr., J. L. Dobie, and D. R. Womochel. 1988. Stratigraphy and depositional environments of the Turnipseed dinosaur site in the Upper Cretaceous Demopolis Chalk of Montgomery County, Alabama. Journal of the Alabama Academy of Science 59:34–48. Wright, K. R. 1988. The first record of Clidastes liodontus (Squamata, Mosasuridae) from the Eastern United States. Journal of Vertebrate Paleontology 8(3):343-345. Bell, G. L., Jr. 1986. A pycnodont fish from the Upper Cretaceous of Alabama. Journal of Paleontology 60:1120–1126. Bell, G. L., Jr., and M. A. Sheldon. 1986. Description of a very young mosasaur from Greene County, Alabama. Journal of the Alabama Academy of Sciences 57:76–83. Waters, J. A. and G. L. Bell, Jr. 1986. A new occurrence of Granatocrinus granulatus (Roemer) from the Fort Payne Chert of Alabama. Journal of Paleontology 60(1):177-180. Ehret, D.J., and J.A. Ebersole. 2017. New Late Cretaceous (Santonian-Campanian) genus of lamniform shark from the Mooreville Chalk of Alabama, USA. Abstracts, Technical Session II, Society of Vertebrate Paleontology, 77th Annual Meeting, p. 107. Burns, M.E., and J.A. Ebersole. 2016a. Juvenile Appalachian nodosaur material (Nodosauridae, Ankylosauridae) from the lower Campanian lower Mooreville Chalk of Alabama. Abstracts and Posters Session IV, Society of Vertebrate Paleontology, 76th Annual Meeting. Burns, M.E., and J.A. Ebersole. 2016. New Appalachian armored dinosaur material (Nodosauridae, Ankylosauria) from the Maastrichtian Ripley Formation of Alabama. Abstract, Paper No. 22-5, The Geological Society of America, Southeastern Section, 65th Annual Meeting. Jacquemin, S. J., J. A. Ebersole, D.J. Cicimurri, C.N. Ciampagalio, M. Jones, and Z. Whetstone. 2016. Quantifying heterodonty in the late Devonian (upper Famennian) sharks Cladoseleche and Ctenacanthus from the Ohio Shale, USA. The Geological Society of America, North-Central Meeting, April 18-19, 2016; Abstracts and Posters, Session No. 22. Ehret, D. J., T. L. Harrell, Jr. and J. A. Ebersole. 2015. Feeding traces on Pteranodon longiceps (Reptilia: Pterosauria) bones from the Late Cretaceous (Campanian) Mooreville Chalk. Abstracts, Poster Session IV, 75th Annual Meeting of the Society of Vertebrate Paleontology, Dallas, Texas, p. 120. Ehret, D. J., and J. A. Ebersole. 2014. Occurrence of the megatoothed sharks (Lamniformes: Otodontidae) in Alabama, USA. Abstracts, 7th Annual Meeting of the Southeastern Association of Vertebrate Paleontology, Jackson, Mississippi. Ebersole, J. A. 2014. Nodosaur. Encyclopedia of Alabama. Published online January 13, 2014. http://www.encyclopediaofalabama.org/face/Article.jsp?id=h-3553. Gentry, A. D. 2014. New stem-Chelonioid material from the Upper Cretaceous of Alabama and the taxonomic validity of the genus Ctenochelys (Testudines: Toxochelys). Posters with Abstracts, 7th Annual Meeting of the Southeastern Association of Vertebrate Paleontology, Jackson, Mississippi. Prieto-Marquez, A. P., G. M. Erickson, and J. A. Ebersole. 2014. A new hadrosaurid from Appalachia and the evolution of the facial skeleton in ‘duck-billed’ dinosaurs. Journal of Vertebrate Paleontology, Program and Abstracts, Technical Session XIV:201. Lively, J. R. 2013. Eocene Gyrolithes-Thalassinoides ichnocoenoses from Alabama and Peru: implications for marine vertebrate taphonomy. Poster presented at the Geological Society of America annual conference, 2013. Lacefield, J. 2013. Lost Worlds in Alabama Rocks: A Guide to the State’s Ancient Life and Landscapes, 2nd Edition. Alabama Museum of Natural History, Tuscaloosa. 276 pp. Brochu, C. A., R. K. Denton, Jr., B. S. Grandstaff, and D. C. Parris. 2012. Southern northern crocodiles: Borealosuchus from the Campanian of Alabama and the early biogeographic history of crocodilians in North America. Society of Vertebrate Paleontology Abstracts with Programs 2012:68-69. Brudatte, S. L., Chioniere, J. N., R. B. Benson, T. D. Carr, and M. A. Norell. 2012. Theropod dinosaurs from the Late Cretaceous of Eastern North America; Anatomy, systematics, biogeography an new information from historic specimens. Society of Vertebrate Paleontology Abstracts with Programs 2012:70. Ruez, D. R. 2008. Ice–Age mammals of Alabama and the state’s paleobiogeographical position. Earth Science Posters Abstracts, Journal of the Alabama Academy of Science 29(2):117. Ruez, D. R. 2008. Ice–Age mammals of Alabama and the state’s paleobiogeographical position. Alabama Academy of Sciences, Section III, Earth Sciences, Poster 9. Shaver, W., B. Schubert, and S. Wallace. 2006. The cave of sloths: a description of the Megalonyx jeffersonii remains from ACb–3 Cave, Colbert County, Alabama. Journal of Vertebrate Paleontology 26(3, Supplement):124. Lamb, J. P., Jr. 2001. Dinosaur egg with embryo from the Cretaceous (Campanian) Mooreville Chalk Formation, Alabama. Abstracts, Journal of Vertebrate Paleontology 21(3):70-71A. Lamb, J. P., Jr. 1998. Lophorhothon, and Iguanodontian, not a Hadrosaur. Abstracts, Journal of Vertebrate Paleontology 18(3):58A. Lamb, J. P., Jr. 1997. A Late Cretaceous land bridge in the Gulf of Mexico Basin. Abstracts, Journal of Vertebrate Paleontology 17(3):59A. Lamb, J. P., Jr. 1997. Marsh was right: Ichthyornis had a beak! Abstracts, Journal of Vertebrate Paleontology 17(3):59A. Lamb, J. P., Jr. 1996. Ankylosauria from the Upper Cretaceous of Alabama. Abstracts, Journal of Vertebrate Paleontology. Hooks, G. E., III. 1995. A new specimen of Calcarichelys gemma from the Mooreville Chalk (Campanian) of Alabama. Journal of Vertebrate Paleontology 15(3):35A-36A. Sheldon, A. M. 1994. Ecological implications of mosasaur bone microstructure. Journal of Vertebrate Paleontology 14(3):45A. Lamb, J. P., Jr., L. M. Chiappe, and P. G. P. Ericson. 1993. A marine Enantionithine from the Cretaceous of Alabama. Journal of Vertebrate Paleontology Abstracts 13(3):45A. Lamb, J. P., Jr., G. L. Bell, A. K. Rindsberg. 1991. The Catoma Creek scrap fauna (Late Cretaceous) from Montgomery County, Alabama. Journal of Vertebrate Paleontology 11(3, Supplement), Abstracts of Papers. Lamb, J. P., Jr. 1989. Functional hearing in mosasaurs reassessed. Journal of the Alabama Academy of Science 60(3): Abstracts. Meylan, P. A. 1988. The potential contribution of the collections of the Red Mountain Museum to a science center in the City of Birmingham. A report to the office of the Mayor. Bell, G. L. Jr., and J. P. Lamb. 1987. Additional investigations in northwest Alabama caves. Journal of the Alabama Academy of Science 58(3):99. Bell, G. L., Jr., and J. P. Lamb. 1987. Paleolog. Unpublished manuscript on file at McWane Science Center, Birmingham, Alabama, 6 pp. Rothschild, B. M., L. D. Martin, G. Bell, and J. Lamb. 1987. Avascular necrosis in Cretaceous reptiles. Journal of Vertebrate Paleontology 7(3) Supplement, Abstracts of Papers. Sheldon, A. M. 1987. Juvenile mosasaurs from the Mooreville Chalk of Alabama. Journal of Vertebrate Paleontology 7(3):25A. Bell, G. L., Jr. 1985. Vertebrate faunal zones in the Upper Cretaceous of west central Alabama. Geological Society of America Abstracts with Programs 17(2):80. Bell, G. L., Jr. 1985. Ground sloths from a cave near Tuscumbia. Journal of the Alabama Academy of Science 17(2):80. Bell, G. L., Jr. 1985. Stratigraphy and fauna within latest Wisconsinan deposits in Bell Cave, northwest Alabama; pg. 8- in Geological Society of America, Southeastern Section, 34th annual meeting, Abstracts and Programs. Geological Society of America 17(2):80. Grass, A. D. 2014. Inferring lifestyle and locomotor habits of extinct sloths through scapula morphology and implications for convergent evolution in extant sloths. PhD Dissertation, University of Iowa, 123 pp. Carlisle, C. N. 2013. Archaeology after the field: assessment of the Josselyn Collection at the University of Alabama Birmingham. MS Thesis, Department of Archaeology, The University of Alabama, Tuscaloosa. 81 pp. Holte, S. E. 2012. Description of Jefferson’s Ground Sloth (Megalonyx jeffersonii) from ACB-3 cave, Colbert County, Alabama, with comments on ontogeny, taphonomy, pathology, and paleoecology. Thesis, East Tennessee State University, 180 pp. Konishi, T. 2009. Systematics of Plioplatecarpinae (Squamata: Mosasauridae). PhD Dissertation, University of Alberta. Hooks, G. E., III. 1995. Redescription of the Protostegid Turtle Calcarichelys gemma Zangerl, 1953 and Systematic Revision of the Protostegididae using Cladistic Analysis. MS Thesis, Auburn University, Auburn, Alabama, 68 pp. Sheldon, A. 1995. Ontogeny, ecology and evolution of North American mosasaurids (Clidastes, Platecarpus and Tylosaurus): evidence from bone microstructure. Unpublished MS Thesis, University of Rochester, New York. Shannon, S. W. 1975. Selected Alabama Mosasaurs. Unpublished MS Thesis, University of Alabama, Tuscaloosa, Alabama, 77 pp.